2,000 sf Mid-Century Modern Westward Look Guest House in the Catalina Foothills. The Westward Look house was designed by noted Mid-Century Architect Nicholas Sakellar, FAIA. The home is modern in concept, yet has the character of an older home. Sited in the foothills of the Catalina Mountains, the home is beautifully located for scenic views. The Guest rental is separate from the owner's residence divided by a partition wall. The spacious guest house include a large kitchen, nature room, living room, master bedroom, bathroom, large walk-in closet, library/second bedroom, covered porches, backyard, pool, and laundry room. The home features a expansive back yard, pool, and covered porches. This charming modern house is a vacation oasis complete with beautiful furnishings, artwork, culinary kitchen and fireplace. The house has been featured in several home tours over the years and is considered a Tucson landmark. I am a Tucson native and second generation architect. My father designed and built the house in 1961 and this is were my siblings and I grew up. Now that my children are grown and moved out I live and have an architectural studio in the west half of the house with a separate entrance. 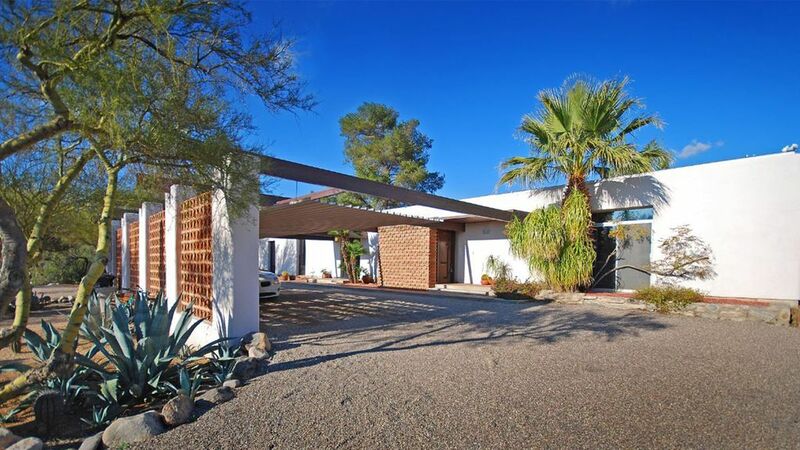 The home has historic significance to Tucson as a classic example of mid-century modern architecture and the family of architects that has designed many distinguished buildings in the Southwest. The neighborhood has changed little over the last 55 years maintaining its natural Sonoran Desert vegetation and beautiful Westward Look Resort grounds. The home was orientated to take full advantage of the view up Pima Canyon in the Catalina Mountains. The open floor plan and abundant sliding glass doors give the home a light and relaxing atmosphere. The screened porch and covered patios extend living spaces out doors. Double sinks in a common bathroom area with a sliding glass door to the pool area, separate toilet room, sunken tub w shower. See floor plan for layout. A spectacular view of the Catalina Mountains. There is a separate owner's apartment and architectural studio located on the property with a separate exterior entrance. Fantastic views. Glass walls in DR and LR. Very modern kitchen with 14 foot butcher top island. Dino is a great landlord. We loved our stay at the property and would definitely return. The home was beautiful and well-equipped. The views of the mountains were spectacular. Dino was a wonderful host. A gorgeous property with stunning views of the mountains. The house is a wealth of interesting detail for someone like me who is interested in architecture. It is very spacious with comfortable furniture, lots of books, and a large and workable kitchen. One cannot describe what it's like to sit with your morning coffee or tea and gaze on the mountains. Not only is the host very personable and charming, he is a lot of fun but never intrusive, even though he lives on the property. We have traveled a lot, and this host and this house are the best we've ever encountered. Beautiful home in a great Tucson location. The home was very clean and comfortable. Very modern kitchen. Outside grounds very well maintained with beautiful mountain views. The owner in on site in this divided house and available if needed. We have rented many VRBO's and this is by far at the very top of our list. We stayed here during graduation and it was nice to be out of the busy downtown (due to graduation) and find respite in this home, so we loved the location. The kitchen is large and extremely well stocked. The home is very comfortable and spacious. The owner was extremely responsive to any issues or concerns. We immediately felt at home due to the owner's welcome, the beautiful setting and comfort in every room. Windows abound to bring in the light and allow for beautiful views of the mountains. The patio was a favorite hang out space in the late afternoon and evening to watch the colors on the mountains change hour to hour. We used the pool daily as it was warm enough at this time of year and a great size for all to enjoy. Thank you Dino for making our week of celebration even more fabulous by the use of your incredible home! We would give a rating of 7 stars if it were an option.! Wonderful property with amazing views of the Catalina Mountains. The Westward Look property is conveniently located in Tucson with great proximity to shopping, dining, hiking and exploring. The views are tremendous of the Catalina Mountains and the property features an expansive yard with a large, beautiful pool. The residence is rich with mid century architectural design both inside and out, featuring great art pieces and a rich family heritage. The interior is very comfortable and the owner is very responsive and a wealth of knowledge of places to experience. Wonderful time! A cancellation fee of $300 will be applied to all cancelled reservations. Rates are subject to change without notice.